Scaling has been debated quite a bit in cryptocurrencies themselves. Indeed, Bitcoin’s biggest fork “Bitcoin Cash” occurred due to disagreements about scaling. Scaling problems exist in other places in the cryptocurrency world as well, though. Exchanges — the websites where you “exchange” fiat money or cryptocurrencies for other cryptocurrencies — must be able to handle a truly ludicrous number of users at the same time. And lately, with the surge of interest in cryptocurrency, we’re looking at doubling, tripling, or even quadrupling the userbase of some exchanges in a very brief amount of time. It’s not uncommon for exchanges to disable new user registrations during times like these so that they can have some extra time to prepare their systems. Imagine running a restaurant and suddenly getting an influx of three times as many customers than you’re used to — I bet that would be a real problem! Not too long ago, my favorite altcoin exchange Binance announced that it temporarily disabled new user registrations in order to facilitate an upgrade of its infrastructure. Since this announcement it has re-opened its doors, but only in a limited fashion. It’s unclear how long this will last, but have no fear — if you’re new to cryptocurrency and want to get in on tokens and coins, I’m here to help! This article focuses on KuCoin as an alternative to Binance. One major benefit of this exchange is that it often supports newer, less known coins long before other exchanges. When I wrote my article about RaiBlocks, for example, KuCoin was arguably the only trustworthy exchange performing trades for the currency. I’ve also noticed that the fees on KuCoin are a bit lower than Binance. If you don’t have any cryptocurrency yet, altcoin exchanges like KuCoin aren’t going to help you until you first trade some fiat money (e.g., U.S. dollars) for a major coin like Bitcoin or Ethereum. You can skip this section if you already have some ETH or BTC to trade for whatever altcoin you’re trying to ultimately buy. Coinbase is arguably the most trusted exchange currently on the market. You can think of them as the PayPal of the cryptocurrency world, with all the good and bad connotations that come along with that. There are some countries where this is not the case! For example, in Canada, one would probably want to use QuadrigaCX instead. Unfortunately, that’s outside the scope of this guide, but I do have a country-by-country guide which may help you if Coinbase doesn’t work in your area. Once you are up and running there are a number of options when it comes to actually paying for coins via Coinbase. It is possible to link your bank account to Coinbase but actually transferring coins out of Coinbase will be impossible for a few days while the funds are clearing. This is obviously not ideal if you want to move quickly, as you would now have to wait several days to move your coins to an exchange where you can trade them for various altcoins. For example purposes, we will use a lesser-known coin called “Bounty0x” or “BNTY” throughout this guide. In my opinion if you intend to buy altcoins, ETH is the best choice to buy here. Why? Well, with regards to LTC, the reason is clear: other exchanges like KuCoin offer direct trading pairs for BTC and ETH, but not LTC or any other currency. What this means is that you could directly exchange your ETH for BNTY, or your BTC for BNTY, but you’d have to perform another step if you wanted to trade your LTC for BNTY (and that means more fees!). Obviously we don’t want to waste even one cent if we can avoid it, so LTC is out. First, we’re going to make KuCoin account. Just follow the link, then fill in your email and password before clicking “Start trading now.” Make sure that you choose a strong password (this should be different than the one you used for Coinbase or anything else!). Once your account is made, the first thing we want to do is fund it. Hover over the little dollar sign button at the top right, then click “Deposit” once the box pops up. 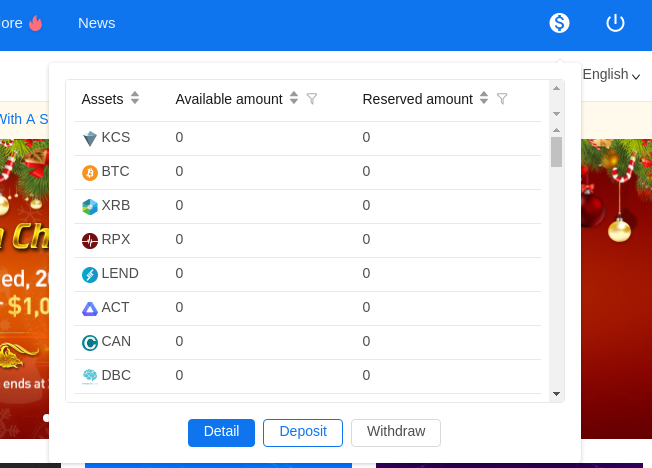 Time to deposit cryptocurrency to KuCoin! Once you’ve clicked Deposit, you should end up on a screen where you’re being asked to set up Google Authenticator, an Android application which increases your security. This is a form of “2fa” or “two factor authentication,” an important security step which helps keep your account safe. I personally recommend that you use an inexpensive Android phone for this and nothing else other than perhaps a Coinomi wallet for other cryptocurrencies. You can get one for around $30 — this is significantly less costly than a deluxe hardware wallet like a Trezor or a Ledger Nano S, and unlike those wallets your phone can serve double duty as a 2fa device. My opinion is that it’s a bad idea to use your regular phone for this — your phone could have malware and you probably always have it online, which means it’s always available for malicious hackers to attack. With an inexpensive spare Android phone, however, you can just take the battery out when you’re not using it for crypto purposes. You should be on a screen that looks like the above, except the blue square is replaced with a QR code (the image with the black squares) and the equivalent “key” above it (a series of letters and sometimes numbers). This isn’t as complicated as it seems — but before moving on, make sure you write down that key and keep it somewhere safe and private. This is important in case you lose your phone. Now all you need to do is load up Google Authenticator on your phone and press the “+” button, then press “Scan a barcode.” Scan the QR code on your screen with your phone’s camera (or input the key manually, if you prefer) and the Google Authenticator app should present a six digit verification code which is reset every minute or so. This is what you will put in the field on the right, with no spaces. Any time you need a key in the future (such as when withdrawing coins, etc. ), simply pull out your phone and it will be there. Cool, right? Let’s move on. Unlike the picture, there will be an address listed where the blue box is in my example. This is a very long series of letters and numbers, and is the fundamental basis of most if not all cryptocurrencies. An “address” is simply the destination for funds — think of it like the account and routing numbers at the bottom of your checks. For many cryptocurrencies such as Bitcoin it is possible to have multiple “receiving addresses” which point towards the same wallet. The address listed here is KuCoin’s “receiving address” for your Ethereum. Highlight it and put this address into your copy/paste buffer. 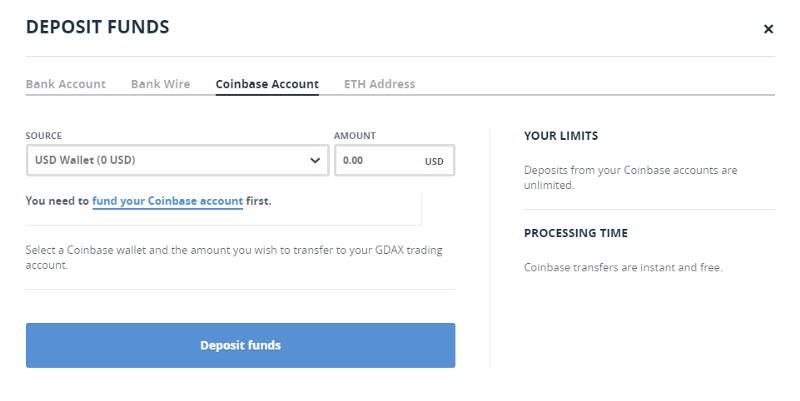 Then, in your Coinbase account, navigate to the Accounts tab and then to your ETH Wallet. Paste in your address. You should double check that the pasted address is the same one you saw on the page in KuCoin — you can never be too sure when it comes to security! Once you’re sure you’re sending to the right place, input the amount of ETH you’d like to send. This guide will assume you aren’t interested in holding any ETH, and just want to buy some Bounty0x (BNTY) — so, specify the entire amount of your ETH holdings and click “Send. Once you’ve done this, you can click “WITHDRAW” in GDAX and send your funds from GDAX to KuCoin. Fees are significantly reduced with this method! before allowing you access to your funds. Before we move on, here’s a quick reminder: KuCoin does not trade all the same cryptocurrencies as other exchanges like Binance and HitBTC. This means that if you’re looking for coins like ARK, TRON, or IOTA, you might not find them here; this is one reason why I tend to recommend Binance over other exchanges. On the other hand, KuCoin is establishing a name for itself as a trustworthy place to trade coins you simply can’t find elsewhere. As you can imagine, it’s a good idea to have accounts at multiple trusted exchanges, especially for scenarios where your preferred exchange is down and you want to buy or sell coins without delay. As stated before, in this example we are trying to get some Bounty0x (BNTY), which KuCoin does support. Now it’s finally time to trade your ETH to BNTY. This is blessedly simple. At the top of the front page of KuCoin, click “Markets.” Click “ETH” and search for “BNTY/ETH” in this list, and click it. Now you are on the trading page. On the next page you may be prompted to fill in your current 2-Step verification code — do so with your phone, then direct your attention to the area beneath “Buy BNTY.” Click the number to the right of “Best price.” Then a number will appear to the right of “Max” — click that too. This is what it looks like to buy Bounty0x. This indicates to KuCoin that you’d like to trade all of your ETH for a commensurate amount of BNTY for no more than the price listed above (in this example, 0.000318 ETH per BNTY). The price field is automatically listed based on the current market. If you like, you can change it to a different price, but like any market it’s not guaranteed that someone will buy at the price you’d like. Your order will remain open until it’s been fully filled or you cancel it. There are several options here such as Stop-Limit orders, etc., but this is outside the scope of this guide. In this case, you are simply placing a “Limit” order for some BNTY. I Bought My Altcoin: Now What? If you want to be totally secure, there are more steps to this process. For most cryptocurrencies, it is ideal for you to withdraw your coins from KuCoin and store them in an offline wallet for security purposes. Use an inexpensive Android phone with the Coinomi wallet app, or go ultra secure with a hardware wallet like the Ledger Nano S or Trezor. The details of these wallets are a little outside the scope of this guide, but I have discussed them in previous articles. If you’re looking for more information about altcoins, take a look at my page — I’ve written a lot about this! If you’d like to read about more exchanges, I’ve also written about another alternative called HitBTC.